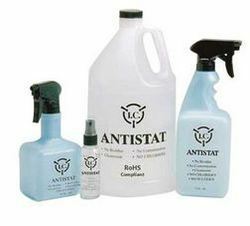 The Antistatic Spray attracts dust and also prevent materials from feeding properly. An Anti-static agent for neutralizing static electricity built up on rubber, plastics, metals, polymeric components and synthetic fibers. Neutralizes and Eliminates Static Electricity. Weicon Stainless Steel Care Spray has been formulated to particularly serve as an antistatic cleaning and preserving care agent for mat and glossy stainless steel surfaces indoor and outdoor. Static electricity, accumulated on surface like monitors, mobile, work surfaces, carpets, etc. , can be the cause for ESD failure, as also attracts dust and contamination. 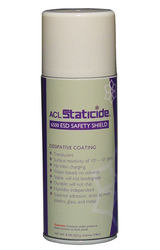 Antistatic spray or solution, when applied would create a conductive path on that inaccessible surface discharging the static charges temporarily affecting for approximately 48 hours depending on the usage. - Counteracts static electricity charges that attract dust, prevent materials from feeding properly or "shock" equipment operators. - Helps prevent data dropouts and damage to a computer's logc. - Use on natural or synthetic rugs and carpeting, furniture, drapes and chairs. - Can also be used on metal rollers, drive belts, scanners, electronic image processors. We are engaged in offering Textile Spray For Autoconer Machine. It is also called as Autokleen. - It is Specialty Formulation for Easy and Effective Operation of Automatic Cone Winding Machine in Textile Industry. the Static Charge Developed on the Splicing Blades Attracts Dust and Cotton Particles. Decora Kitchen Interiors Pvt. Ltd.
1)Counteracts static electricity charges that attract dust, prevent materials from feeding properly or "shock" equipment operators. 2)Helps prevent data dropouts and damage to a computer's logc. 3) Use on natural or synthetic rugs and carpeting, furniture, drapes and chairs. 4)Can also be used on metal rollers, drive belts, scanners, electronic image processors.